Kettlebell lifting is great for your heart. Properly used, kettlebells are safe. Kettlebell Training improves body composition. Kettlebells are compact, inexpensive, and virtually indestructible. Kettlebells are easy and convenient to travel with – a mobile gym! Rowing is a sport that inherently creates muscle imbalance and dysfunction. For example, it is common for sweep rowers to overdevelop the latissimus dorsi musculature on one side – both in size and strength. Over thousands of strokes, we are patterning a movement and over developing one side of the body which in turn may effect how it moves outside of the boat. Scullers may believe this does not concern them, but this is far from the truth! The rowing stroke for a sculler – the movement itself – is symmetrical but it does not mean that a sculler is recruiting, sequencing, and activating those muscles symmetrically. An EMG (electromyography) study was conducted on a sculler of an elite international level. The study demonstrated that EMG curves are quite asymmetrical: the left hamstring and glute produced higher electrical impulses at the middle of the drive, but the right quadriceps does more at the finish of the drive (3). This is where kettlebell training can help rowers. Kettlebells allow us to identify strength asymmetries and correct them. 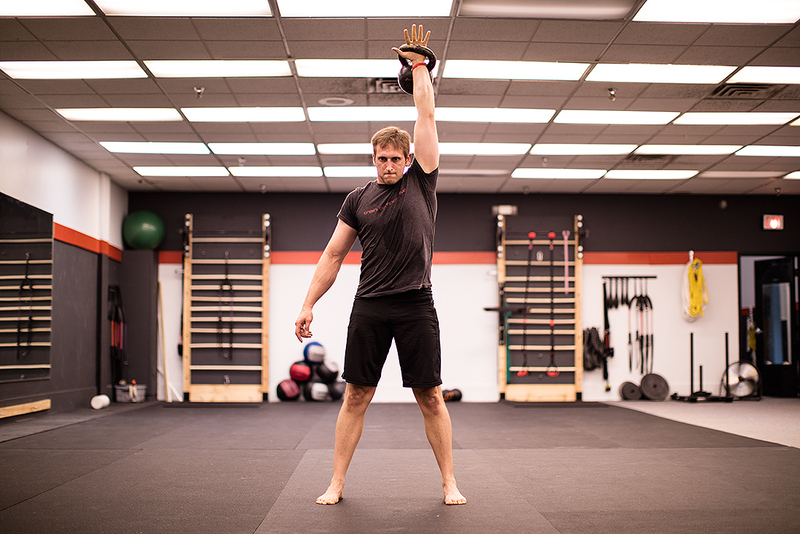 The majority of the kettlebell lifts can be done in a single arm fashion. The kettlebell lifts are both an assessment and a strength exercise. By promoting strength symmetry we are not only taking steps to gain greater power and go faster but we are eliminating underlying compensations that result in movement dysfunction – thus reducing an athlete’s ability for injury. Gaining symmetry and balance decreases the risk for injury and helps improve overall health and well-being. In the end, we are all looking for a way to gain greater speed on the water. In a recent study published by the Journal of Strength and Conditioning Research, a group of female collegiate soccer players underwent a 4 week study to determine a change in VO2 Max. One group used kettlebells and the control group performed free-weight and bodyweight exercises. After four weeks the results were clear: the athletes that trained with kettlebells saw a 6% increase in their VO2 Max (4). In my fifteen plus years of rowing experience I’ve strength trained with barbells, dumbbells, and machines. Rowing, sweep or scull, is an asymmetrical movement pattern. To balance this, strength training needs to account for that. Doing single arm kettlebell swings, military presses, front squats, snatches, the turkish get up and deadlifts allow for development of strength symmetry. This is a benefit that I never experienced using other strength training equipment. Craig Buckhout, 1977 IRA Champion with Cornell, had this to say, “The training we have done has improved my core strength and stability, and the kettlebell work has been particularly useful. Trying to replicate the movement of the kettlebell swing, while in the boat, has improved my stability and reduced my splits.” In my opinion, nothing is more effective than strength training with kettlebells and it is the ideal tool for rowers. Note: I do use a barbell in my training for lifts such as the deadlift and benchpress and they certainly have their place. The majority of my strength training is done with three tools: kettlebells, bodyweight, and indian clubs. I will be covering the other two modalities in future blogs. 1) Wesley, Corey. 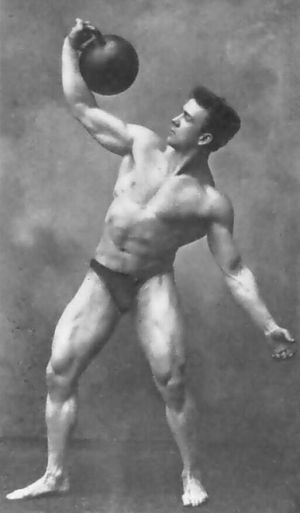 History of the Kettlebell. Kettlebell Science. Website. 2) Tsatsouline, Pavel. Enter the Kettlebell. St. Paul, MN: Dragon Door Publications, 2006. Print. 3) Kleshnev, Dr. Valery. Rowing BioMechanics Newsletter: EMG for analysis of rowing Technique. BioRow. Website. Thank you for your response Susie. Please feel free to let me know if you have specific topics you would like me to cover in future blog articles. Have a great weekend!